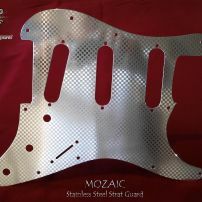 commented on "Mozaic Stainless Steel Strat Pickguard Fender Stratocaster SSS Chrome Guard"
NOW IN STOCK. Small Embossed Squares With Each Square Lined in Alternate Directions. 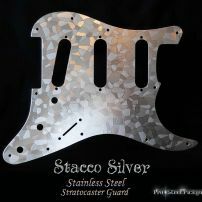 Patterned and Polished Stainless Steel. CLICK FOR DETAIL. 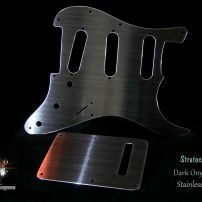 commented on "Dark Onyx Fade Strat Guard and Trem Cover Stainless SSS Pickguard Fender Stratocaster Backplate"
OUT OF STOCK - For a Strat wanting a special dark guard with a silver lining, including matching backplate. With dark polished stainless steel screws. 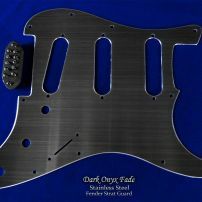 commented on "Dark Onyx Brushed Faded Black Satin Strat Guard Stainless Steel SSS Pickguard Fender Stratocaster"
OUT OF STOCK - For a Strat wanting a special dark guard with a silver lining. With dark stainless steel screws. 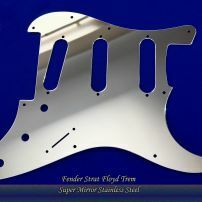 Matching Strat Backplate also available. 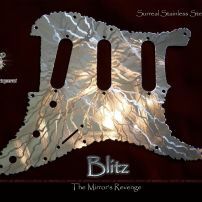 commented on "Blitz SSS Fender Strat Stainless Steel pickguard Savaged Mirror Stratocaster Guard"
The Mirror's Revenge! 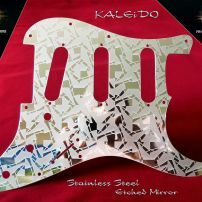 Blitz is an artfully savaged mirror pickguard, then finished with attention to be smooth to the touch. Easy on playing, killer on the eye. 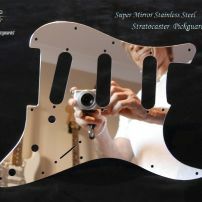 For Fender Stratocaster SSS. Click image for larger view.